Combination test with axial stress and torsional stress can be performed by adding biaxial forces to a test piece simultaneously. Phase between the forces can be controlled freely. 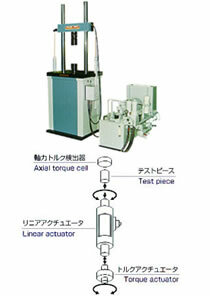 It consists of linear servo actuator and rotary servo actuator.